Prince William and Duchess Kate gave Britain a new monarch this week – George Alexander Louis, formally known as His Royal Highness Prince George of Cambridge. The new royal baby, third in line to the throne after his dad and grandpa, will someday make it to #1 when he assumes the role of King. 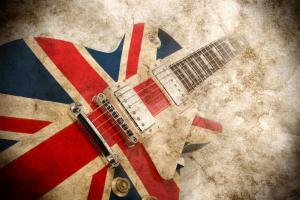 However, there are countless British musicians who’ve already made it to #1 – with #1 hit songs, that is! Check out the British music royalty who reached #1 on the Billboard Hot 100 chart in the US (established 1958) and stayed in that position for five weeks or more. The list below shows the date, song, artist(s), and the number of weeks the song stayed in the #1 position. Additional British artists who came up just shy of our list with one or more hits that lasted for four weeks in the #1 spot include The Rolling Stones, George Harrison, Bonnie Tyler, Queen, George Michael, Pink Floyd, Steve Winwood, The Spice Girls, Phil Collins, and Leona Lewis. Britain certainly has produced some amazing artists. Let’s not forget about these other singers, songwriters, and musicians who came from “across the pond,” all of whom could arguably be considered British music royalty – Peter Frampton, Black Sabbath, Annie Lennox, Seal, Robert Palmer, The Who, Andrew Lloyd Webber, Joe Cocker, The Kinks, Amy Winehouse, Herman’s Hermits, David Bowie, Duran Duran, Petula Clark, Cat Stevens, Led Zeppelin, Joss Stone, Eric Clapton, Sting, Boy George, Radiohead, Ozzy Osbourne, Mumford & Sons, and others … and who knows, maybe someday George Alexander Louis, His Royal Highness Prince George of Cambridge!